GCompris is free open source educational software designed for ages 2-10. In addition to promoting education, the developers also want to promote the use of Linux, so the free Linux version has over 100 activities. The Windows version has over 40 activities (you can obtain the full 100 activities for Windows, but the price is 20 euro). We have Windows XP on our machine, and I have to say the the activities provided in the free download are well worth checking out, particularly if you have preschool to kindergarten-aged kiddos. There is a wide range of activities, starting with practicing mouse manipulation. 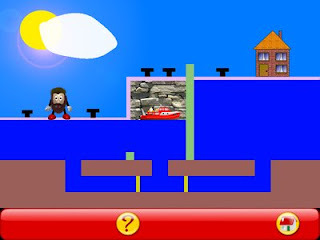 In this activity, the player simply practices moving the mouse (no clicking needed) in order to "erase" the rectangles and reveal the picture in the background. There are several boards, with the rectangles getting progressively smaller, thus increasing the difficulty. 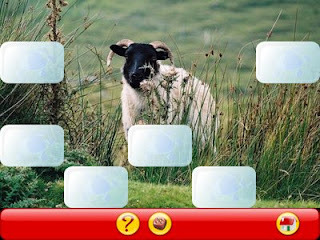 The next activity requires the player to click on the rectangles to reveal the picture. 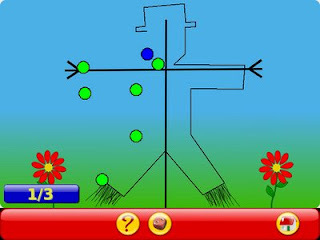 In "Click and Draw", the player clicks on each dot as it turns blue and the computer draws lines to complete the picture. The computer colors in the completed picture and you get some fanfare. Each set of puzzles gets progressively harder with more and smaller dots to click on. These activities do work for improving hand-eye coordination. Less than a week ago, Peter (age 3) was super pleased to be erasing the rectangles all by himself by rolling the trackball. Today, he was completing these pictures by clicking on the dots and extremely proud of himself. See if you can figure out how a canal lock works. And puzzle out how to make a submarine dive to go under oncoming freighters and keep it's current depth to go through underwater gates. One caveat: some of activities have very minimalist instructions. The canal lock, for example, will require some adult explanation of the underlying principle (there's no explanation given, but don't worry, it's just a matter of pointing out how water fills open spaces). 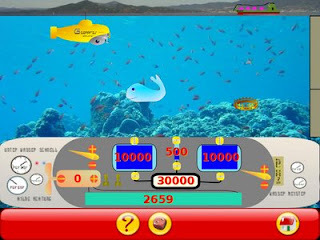 The Submarine activity could also use more explanation as to how the controls work, what their impact is, etc. (this one almost baffled me, but in the end I figured out how to make it work and even how to explain it. I must say, it is quite challenging). That said, this is essentially a game, not a lesson, so I suppose I shouldn't expect too much explanation of scientific principles.